Since appearing on "Shark Tank," innovator Eric Conti has renamed his wine-protection product Air Cork. Mason, Ohio—If you watched ABC’s “Shark Tank” season 3, episode 4, you might reasonably have concluded that Eric Corti sold his wine-preserving device to investors Lori Greiner and Mark Cuban for $400,000. But in the reality TV world, that’s not how it works, and that’s not what happened. He and a partner had invested $65,0000 and sold some 700 balloons at $22 per unit when Corti taped the show last summer. He entertained offers starting at $40,000, and that quickly built to a $600,000 bid from Greiner and Cuban seeking 100% interest. Done deal, right? Leave your balloons behind and move along to your next inspiration. Wrong. “Whatever happens there isn’t binding,” Corti said. “You and the Sharks can do due diligence” after the fact. Simple but ingenious, Air Cork basically is a reusable balloon that’s inserted in a partially consumed bottle of wine and inflated with an attached hand pump until it touches the sides of the bottle, blocking the entrance of excess oxygen. On “Shark Tank,” it vaguely resembled an arcane medical device; since its star turn, it’s been redesigned. The hand pump now is in the form of a grape cluster, in a hue resembling the Napa Cabernets favored by Corti and his wife. The U.S.-manufactured balloon is crafted of a natural rubber, bio-based latex that meets FDA standards for food contact. “Air Cork will not alter the taste of your wine,” the company’s website states. The balloon typically remains inflated for three days. “The beauty is that you can give the pump a couple more squeezes before it loses its seal, if you need a couple of extra days.” The company recommends storing Air Corked bottles vertically at room temperature or in the refrigerator. After the “Shark Tank” episode first aired, 70,000-case Robert Hall Winery of Paso Robles, Calif., ordered some for sales in its tasting room. “We did try it out; it’s pretty neat and the Air Cork package is nice,” said hospitality manager Kristin Odenwald. Air Cork did not exactly fly off the shelves, though. Two months after its arrival in April, Hall had only sold one. “I think they’ll pick up eventually,” Odenwald said. Since then, Livermore powerhouse Wente Vineyards (850,000 cases) sent a purchase order “after extensive testing in the winery,” according to Corti. West Wind Farm & Vineyard (1,500 cases) of Max Meadows, Va., also ordered a supply. In July, the partners took the Air Cork to the massive Atlanta Gift Show. “We had quite a few great new orders, including 40 new retailers across the country,” Corti said. They’ve signed on with a distributor in Canada and have heard interest from businesses in both Europe and New Zealand. By June, sales had climbed to between 8,000 and 9,000 units; since then the figure has reached nearly 15,000, even with the retail price increased to $23.95. Contestants on “Shark Tank” are not paid to appear, but Corti feels the exposure was worth the risk; he’s still in communication with would-be investor Lori Greiner, who regularly hawks products on QVC, a possible outlet for Air Cork. But first-time inventor Corti, whose profession is in construction management, and his minority partner, who’s in sales, have kept their day jobs—and their company. Good choice to not take the deal. 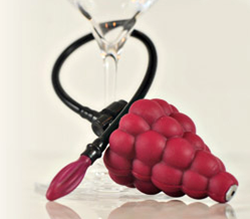 You have a much needed item that wine connoisseurs will purchase one they are educated on how it works. Good job at keeping the$400,000 in your pockets. I just watched this episode of Shark Tank (yes, in 2018) and SO happy to hear he ended up not selling his company to greedy greedy Lori & Co. What money hungry people they were to him, so glad he saw it’s real value and hope business took off for him!